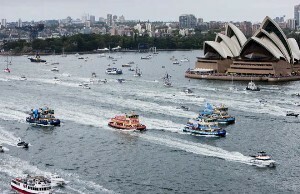 There are many things to do in Sydney in January including the Sydney Festival and Australia Day celebrations. We also have things to do over the Summer School Holidays offering many different ways to enjoy the Summer in Sydney. When the tickets go on sale for the Open Air Cinema they go fast. This is one of the best things you can do in Sydney and consequently it is extremely popular. Pick out the movies you want to see and get those tickets before they are all sold. Good luck and savour the experience. The American Express Open Air Cinema will fill the Bondi air with music and film as the waves roll onto one of the world’s most famous beaches. The music commences proceedings and movies play out in the cool evening air. It’s kind of magical. There will be food, drink and Bondi’s nightlife to end the perfect day. This is one for the kids or to keep the kids busy while you check out the other great things happening in Sydney. Kids in the Park provides a huge range of school holiday activities, lots of which are free. There are activities for creative kids, sporty kids and adventurous kids, including cookies and craft, archery, AFL (Aussie Rules Football), gymnastics, a flying trapeze and science experiments. Click on the link below for more and other school holiday activities in Sydney. How about a spot of tennis? The Sydney International includes superstars of today and tomorrow all battling it out for the championship. Tickets were still available at the time of writing. Summerama is a wonderful program sponsored by Sydney councils up and down the coast. The program consists of various activities from sea kayaking to adventure boat tours to sustainable arts and crafts workshops for kids. You might think you have to travel out to the bush to gain an understanding of Aboriginal heritage. As usual Sydney has it all. Enjoy the beautiful land of the Cadigal people, now the site of the magnificent Royal Botanic Gardens. With your Aboriginal guide by your side you will learn all about the ‘first frontier’ between Aboriginal and European culture. Along with the history discover riches contained within the parks trees and plants providing sustenance, shelter and medical aid to those who know how. As the holidays stretch on you may need a few ideas on what to do.